“Assurance, Believing and Confidence: The ABC’s to the Heart of God” from Christian Faith Publishing author Sophia Wallace Lewin is a wise and deeply compassionate book of short prayers and meditations that will instill in the believer the assurance, belief, and confidence that are the keys to becoming a man or woman after God’s own heart. Published by Christian Faith Publishing, Sophia Wallace Lewin’s new book is a beautiful companion to daily Bible reading and morning prayers, with its short Bible verses to reflect and pray on for the day, followed by a prayer that helps to bring the faithful closer to the truth of the passage, and ultimately closer to the heart of God. 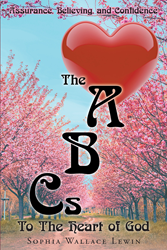 Presented as a collection of prayers addressing each of the three ABC’s—assurance, believing, and confidence—the reader is welcome to focus each day on any one of these short passages, set against a soothing backdrop of scenery, depending on which of these qualities they feel they most need to focus on and bring to God with an adoring heart. View a synopsis of “Assurance, Believing and Confidence: The ABC’s to the Heart of God” on YouTube. Consumers can purchase“Assurance, Believing and Confidence: The ABC’s to the Heart of God” at traditional brick & mortar bookstores, or online at Amazon.com, Apple iTunes store, or Barnes and Noble. For additional information or inquiries about “Assurance, Believing and Confidence: The ABC’s to the Heart of God”, contact the Christian Faith Publishing media department at 866-554-0919.